A replacement to the aging and very popular Canon 7D is rumored to be released in time for Photokina in September. It is expected to be announced the week of September 9. Previously, the camera was rumored to be called the 7D Mark II. 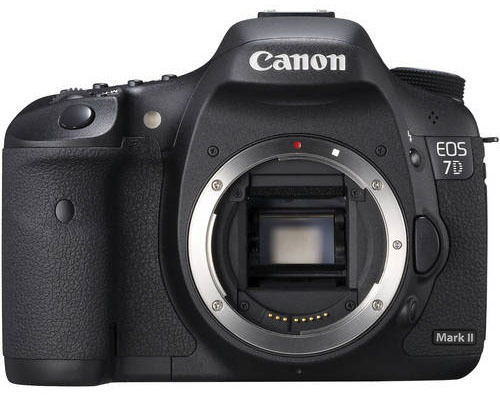 However, recent rumors suggest that it may not receive that designation but will still be considered a successor to the Canon 7D. The camera is rumored to feature an EOS-1 style top plate. As a result, there will be no mode dial and it will function more like a pro-level camera in terms of the external controls. Additional rumors point to a new telephoto lens and many believe/hope that new lens will be the long-time-coming EF 100-400mm L replacement. See the below list of previously rumored specs for the successor to the Canon 7D. I don’t think anyone believes these rumors anymore. IF the rumors ARE true about the EF 100-400, I HOPE CANON introduces an AFFORDABLE replacement. The EF200-400 @ $12K is NOT affordable to a vast majority of serious amateurs and semi-pros. It’s too bad that they don’t reconsider the old EF 35-350 lens for re-release, giving it the “IS” functionality. It would seem to me that it would have very broad appeal to all digital users, whether Full Frame or APS-C camera owners. Regarding the 7D replacement, owning one now for me has been an uncompromised pleasure. Although they are different, I consider it a perfect mate to my 5D Mk II. I would NOT consider upgrading to its replacement, simply because the additional features probably won’t enhance my photo captures. Can we have that in an F mount?